Black Mountain Oct16 from Nigel Gray on Vimeo. 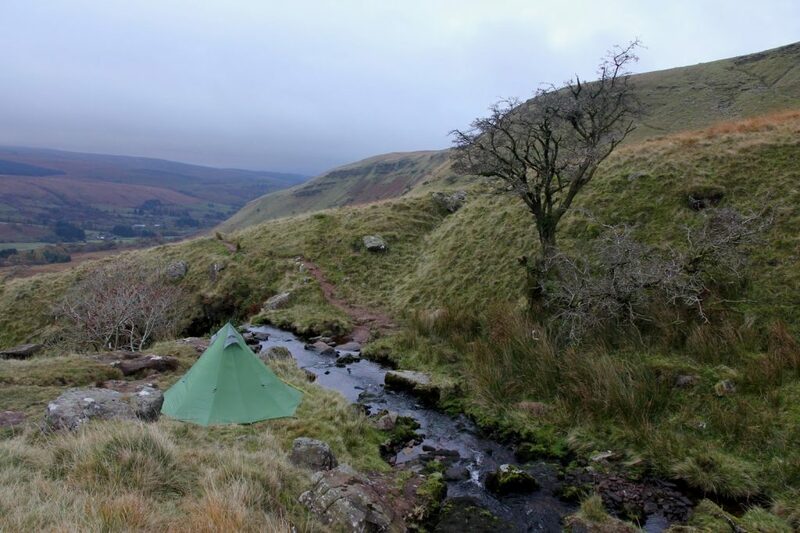 An ‘s‘ and around 40 miles separate the Black Mountains and the Black Mountain, which mark the eastern and western extremes of the Brecon Beacon national park. A Thursday business trip to Cardiff was an ideal opportunity to visit the western Brecon Beacons – the Black Mountain – for the first time. 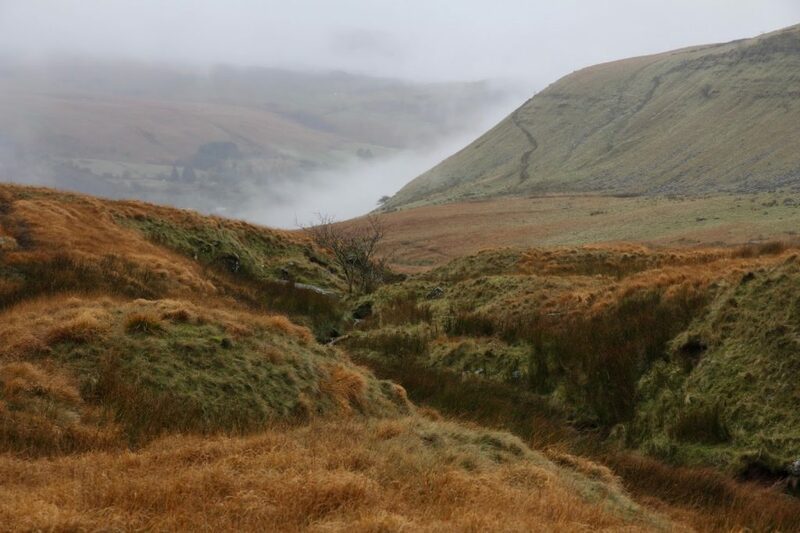 Online photos of the ridge showed the gentle hills to the south abruptly ending in steep-sided cliffs dropping to remote cyms, an escarpment that is repeated further east by Pen-y-fan. Finding a safe spot for the car is always a challenge when spending a few days in the hills. I eventually settled on emailing Dderi Farm near Glyntewe who allowed me to park for a small fee. A longer than expected meeting in Cardiff saw me shooting up the Rhondda valley along the A470 conscious of the nights drawing in. Finding the farm I quickly changed, chucked my food provisions into my pack and headed for the start of the footpath that heads up to Llyn y Fan Fawr from the pub in Glyntewe. The ground was rather mushy and it was only a matter of time before that inevitable misplaced step led to the first slush of cold water into my shoes – a few seconds of shock being the price to pay for wearing unlined trail shoes. I was feeling rather sluggish and hadn’t taken too much notice of the distance up to the lake. The hills ahead were already enveloped in low cloud as forecast and with the light fading quickly it was clear my planned destination wasn’t going to materialise unless I continued traipsing in the dark. The path followed a small stream which cascaded over a number of mini waterfalls. Keeping an eye out for a camping spot I deviated several times but to no avail. Continuing further up, the path crossed the stream and to the left was a small patch of relatively flat ground. I continued up for a few minutes but as the path veered away from the stream I hit more boggy ground and reeds so I decided to head back to the spot by the stream, which as it turned out was the perfect size for my GoLite SL3. I pitched in strengthening wind and rain and settled in for a long dark evening. Expecting colder autumn weather I’d brought a BearPaw Wilderness Design inner for the SL3 – I normally don’t bother with an inner – but it was surprisingly mild for late October. Despite a strong wind through the night it never dropped below 10 degrees in the tent. 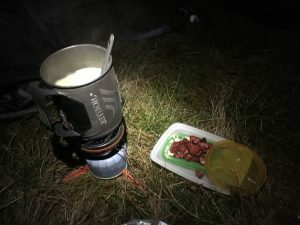 I’d brought my new Spot Gen 3 satellite tracker and sent a couple of OK messages to let the other half know I was safe and sound before tucking into a pasta mug-shot and chorizo before drifting to sleep. I awoke to a clear view down into the valley. I was a little disappointed that I hadn’t made much progress the night before and I could still see the farm where I parked, and hear dogs barking. Breaking camp I could see the higher ground of Fan Fir was shrouded in cloud. Plodding upwards a glint of light reflecting in a small pool marked an occasional break in the clouds but the mood changed as a bleak looking Llyn y Fan Fawr came into view. Flanked by the steep cliffs of Fan Fir to the left, Llyn y Fan Fawr is the larger of the two llyns, hence the Fawr suffix. Heading around the eastern shore the path continued north. 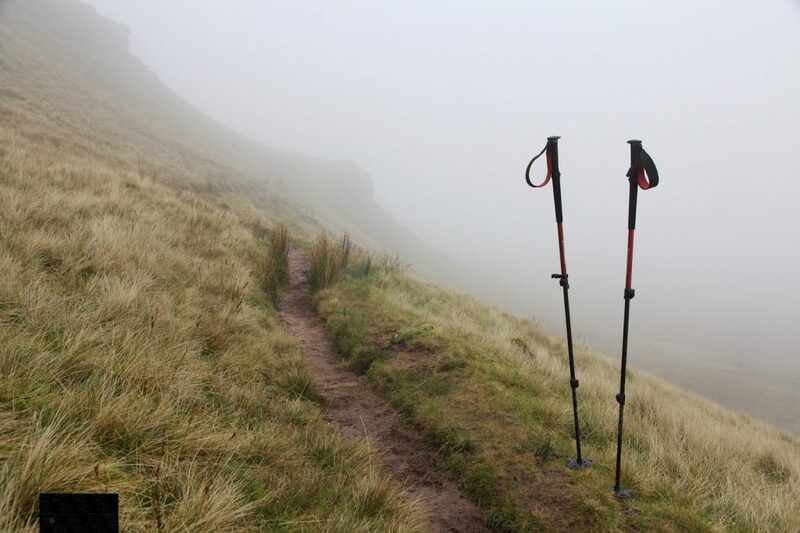 Visibility detiorated for a while as the path hugged the side of the valley below the cliffs. Stopping to photograph a narrow gulley I completely missed a path marked on the map that somehow hops up to the ridge above. 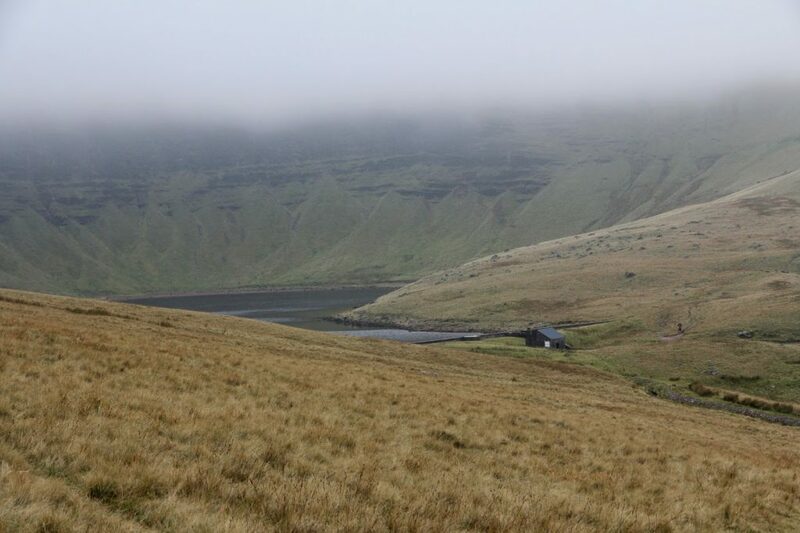 Eventually Llyn y Fan Fach came into view, nestled in a cirque of cliffs and the small bothy. I lunched by the lake, the steep route ahead masking its destination in the cloud. A short slog upwards and I was up on the ridge but visibility down to 20 meters. I had originally planned to head further south from the summit but the clear path around Waun Lefrith made for easy navigation, despite the grey abyss to my left. 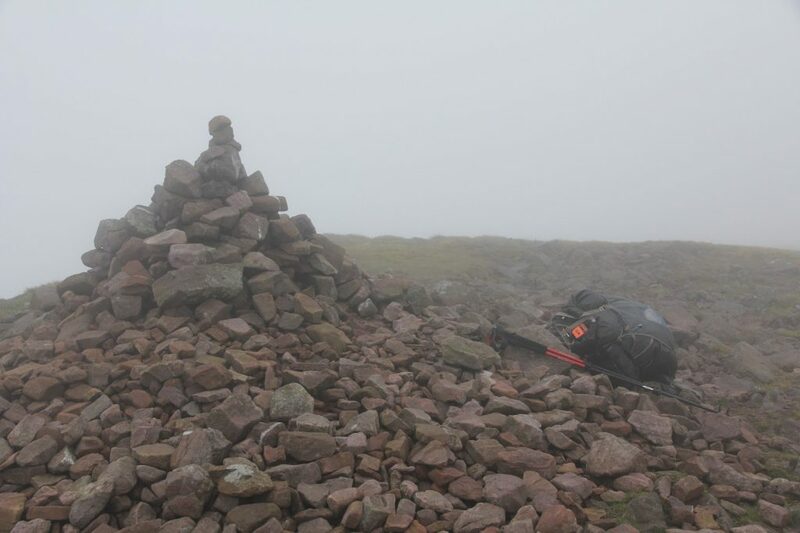 The summit cairn of Banana Sir Gaer came quickly but the mist and a rising wind meant it was no place to stop. I headed on, past Fan Foel, ruing the weather that masked what would surely be such a stunning view. I crouched in the lee of the shelter wall before winding around to the indistinct 802m summit of Fan Brycheiniog. It wasn’t long before I came to the stepped path at Bwlch Giedd that drops from the ridge back down to Llyn y Fan Fawr. The lake gradually appeared out of the mist quicker than I expected. With a northerly wind whipping down the lake I scoured around looking for a suitable camp spot, heading all along the eastern shore to no avail and returning to the southernmost point where I pitched on boggy tussocks. Cooking becomes a welcome chore on long dark damp winter evening. Of late I’ve taken to buying £1 pasta packets and spicing them up with chorizo or tuna. Frying some chopped chorizo bits added some welcome zing and crush to tomato and herb pasta mix. I made a mental note to add dried mushrooms, herbs and chilli oil for next time. A breezy and wet night was even milder than the night before, my Suunto showing 13 degrees during the night. 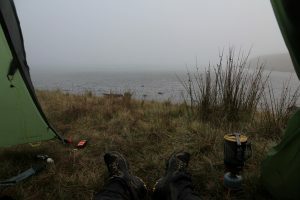 I awoke to no change in the mood and after breakfast stuffed a soaking shelter into the outside mesh pocket of my pack. The launder back down the valley was around 4km and as I dropped out of the clouds golden hues reminded me that autumn was here. 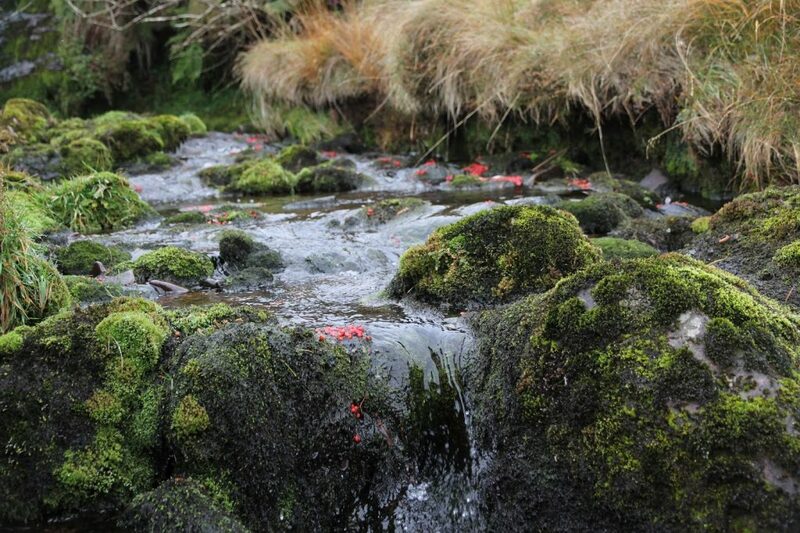 Passing my camp spot from the night before I noticed that the berry tree that 36 hours earlier had looked resplendent in bright red baubels was now bare and clumps of berries clung to the edge of the stream below. Another 30 mins and I was back at the car and changing as the rain returned. The low cloud has spoiled the views but after a busy few weeks at work it was great to clear my head and lungs. I shall definitely return, there’s still plenty to see (literally) and explore. You can view my @socialhiking track here.